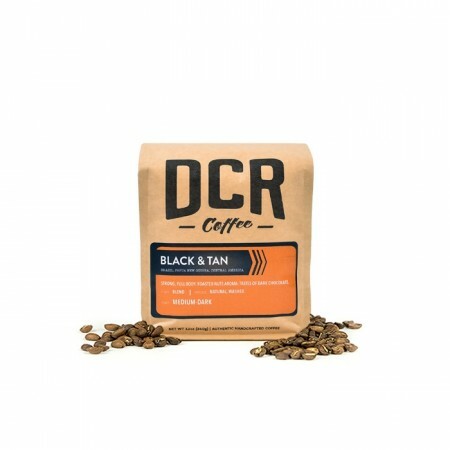 The Black & Tan was carefully roasted for you by Dillanos Coffee Roasters. The combination of dark and medium roasts provides a unique balance of aggressive and sweet flavors. This cup is fantastically rich, with smoky, chocolate and nutty notes. Didn't care for this blend. It was rather flavorless and unexciting. Interesting idea but wasn't our favorite. I think darker works better for us. It wasn't dark enough or roasty enough for my tastes. It isn't bad, but I prefer darker coffees. Smooth, medium coffee. Also, too acidic in my opinion. I like coffee more bitter and rich. Although I loved the smell of this coffee, I found the flavor disappointing. Although smoky and nutty may accurately describe the coffee, I do not find it rich at all. The flavor does not linger but is gone quickly. Also not a very full flavor either. Usually I prefer roasts that are a little bit darker, but this was a good medium blend. Only just got a grinder and only have been able to make one cup. Not bad. Still might be able to make a better impression, but not exactly something to do a backflip over. Still solid. Definitely getting the nutty and smoky notes. Has a over smokey / burnt smell, but smooth and flavorful. This coffee is a good everyday coffee. I've been grinding it and putting it into my Keurig. Soooo bad. Still trying to get the oils out of my grinder. Smells like the bottom of the coffee barrel in a grocery store and tastes like rubber, roaster, and darkness. It's the sort of coffee that my mom might like with her non-dairy Hazelnut creamer. Bitter tasting. Beans very oily. Love this one - so balanced and deep yet not acidic. This one's *way* too dark for me (if anything, I would have wanted to go lighter than the Kickapoo Driftless). Yup! Totally my cup of joe. I enjoyed this coffee would love to try other dark roasts. I loved the nuttiness. Love this coffee! Very smooth and perfect balance. The coffee has a unique flavor. The combo of dark and light roasts makes for a bold flavor without being bitter. I tend toward richer coffees but this was fun to try because it's different from most coffees I drink. Tastes great, if not a little too familiar. Based on the description, I wasn't definitely hoping for something that hopped out at me a little more on the first sip but still an amazing blend to start the morning. I enjoyed this blend, better than over the counter. Looking forward to more roasts. I really liked this coffee and felt that it had a richer flavor than the Parisi, Comparing the 2 coffees, I think I prefer the nuttier flavor profile rather than the chocolate. Thank you! This is my top favorite!!!! Please send more coffee like this. Thank you so much!! This was a pretty enjoyable coffee, although I wasn't knocked out by its flavors. Loved this! We are big fans of dark, robust roasts. This nailed it. I enjoy this blend. I prefer something darker though. I liked the nutty flavor and it was balanced. Thank you! Really good, but if I had to find something I didn't like about it, I guess it's a little nuttier/earthier than I usually like. Excellent first coffee shipment. Bold and not bitter. Good, bold flavor without any offputting aftertaste. Great selection! I had two shots, and both were a little “weak” meaning the taste wasn’t very bold or fully rounded and then the finish fell prematurely too into some almond shell and slightly metal place. This coffee while good, lacks any depth. The character or taste does not change throughout the entire cup, or pot. It is flavorful but could be richer and deeper in flavor. It seems a bit light to me, so I have increased the amount of coffee I am using when I brew it. That has helped so it does not seem as watered down. I really liked this coffee - I think I could do with a little more black than tan, but overall it was great. Very smooth and good flavor. Smooth, but this is not as bold as we prefer. Definitely the type of coffee flavor I prefer - darker roast, warm, earthy, and well-rounded. Once I figured out what settings to brew this on my coffee maker I really enjoyed it. The nutty, smoky flavor did come through without any significant bitter notes. Nicely balanced. I thought it might not be rich enough when I saw that it was a medium roast, but it was rich, nutty and quite pleasant, as advertised. A nice selection and definitely one to go back to. I enjoyed this cup, I am a graveyard and enjoy this when I get off work. For someone that drunks coffee 24/7 this is a good, mild mid day blend. Strong aroma, light acidity smooth taste. This brew came off as too earthy, and not very complex. Not really a fan of the blended dark & tan. The lighter side came through more, and it didn't feel very bold. The smoky aspect did come through, but it didn't come off very smoothly. We enjoy bolder coffees that you find around the holidays, which are not necessarily sweet, but enjoyable with spicy and richer flavors. We also like the darker roasts that have more chocolate and berry notes. All that said, it was definitely not undrinkable, just not a future go-to. It is a little strong for me. I like light roast. I love the low acid coffee. Very smooth and enjoyable, a very good taste we will enjoy for a few more days until it's gone. For our next try, would like something more bold. Thanks! The nutty flavor comes through nicely. Strong flavor, which was nice, made my entire house smell like a coffee shop. Very toasty, smoky, and nutty! A very full bodied cup, but it's a little darker than what I normally choose to drink but all in all not a bad blend. Dark, Full of Flavor, Great tasteGetting Close ! delicious - not bitter adn a strong bold flavor. Very good coffee. Enormous Bloom. Excellent Aroma. Smooth and elegant. A little more bitter than the Unity Organic Blend. We liked that one better. This one was typically the same color of beans we usually use. It was really good.. but compared to the one before not better than that one. It's not terrible, but I'm not crazy about it either. The roast was a little light for my preferences. good coffee. a little on the bitter side, but not awful. i could drink it again! Very good. Loved the aftertaste. Super balanced, and the nuttiness is not overpowering, but definitely prevalent. Really delightful cup of coffee with pleasant aftertaste. Enjoyed this coffee. A medium roast with an excellent bold taste. I'm used to strong, sometimes overpowering, dark roasts. Overall I'm enjoying this and at the very least it's opening my eyes to consider more blends. I used my french press for this...gave it a very nice fresh/bold flavor. I'd order this again for sure. Blooms well. Good brew, but not my favorite. I'm not sure if it was too dark or too "smoky" for me. Love it! So smooth, no harsh or complex flavors. Generally a good coffee. Light, nothing negative. This is a nice day to day coffee. I did not care for this coffee. Beans smelled burnt and coffee tasted very strong and bitter. I do not want to get any more of these coffees. Prices are much higher than my preferred brand. This is a cup of the normal. Kind of expensive for 12 oz more appropriate price for a pound. Good but I am not sure if I would buy it again. We both liked this coffee. Would have given this 5 stars, but waiting to see how we like the Sumatra. Definitely rich, and one worth savoring. We both agreed we liked this the most of all we have had so far. Would buy this one again. It had to be made very strong, I would like a stronger blend moving forward, but overall it was a great coffee. I think I tend to like the very dark roasts. Light flavor, slightly tart for how dark it seemed it was going to be. Amazing aroma. Not my favorite, but very good. I really like this blend! The different flavor profiles balance perfectly. I like the roast of this coffee. Its not too bitter, but still dark. I loved the strength and the nutty flavor without citrus or bitterness. Fantastic cup of coffee!!!!! Not really a fan of this coffee. Smooth but not dark enough. Would like try something with caramel and cream undertones if that exists. Pleasantly surprised with how much I enjoyed my first cup of coffee of this. Looking forward to the many more cups I will get out of this bag. I highly recommend it! Balanced and bold ... no predominant flavors, but still a great cup of coffee from the French press. There is a subtle nuttiness. This is a fine morning coffee to me. Good aroma and a mild taste with no bite. I would buy this for that purpose only. It is not rich enough for an after dinner coffee. We subscribed to dark roasts which I would not consider this coffee to be. Regardless, the coffee is smooth and reminiscent of toasted nuts. The first few sips have a chocolaty quality. Can be a bit weak if not generous with the amount brewed. Overall a solid weekday coffee. A good cup of coffee, goes well with a very sweet muffin. Not to sound like an idiot, but it pairs incredibly with a butterscotch muffin. Best coffee I'v had to date. Did not really appreciate the spicy aftertaste with his one - not terrible but would certainly not buy this through choice. The more we drank this one, the more we liked it. I usually drink a dark roast so I am used to a bitter bite on the finish, but this coffee is extremely smooth and I still get the earthy notes on the end. Overall a very good cup of coffee. The dark side of this blend is great, but I feel the light side is still lending some acidity. I LOVE this coffee, quickly became my new fav! Very good flavors, not quite as bold as I like but very smooth and not bitter at the end. Rich, good flavor. I wasn't overwhelmingly impressed. I had trouble with bitterness. (I blame my shoddy set-up.) When I managed a good cup, it was smoky, nutty and delicious. Even the so-so brews were fine with a touch of cream. Good breakfast coffee. A more easy-going cousin of the Louisiane Blend, but the latter is certainly better. Definitely some pleasant citrus notes, most grapefruit, and some toffee. Loved the taste, but found the flavor a little too subtle. Something slightly more robust with a similar flavor profile would be ideal. It didn't seem like that dark of a roast, but loaded with rich flavor!!! This was a good breakfast blend. It was only three stars for my personal taste (because I prefer a darker roast). However, I would say it was more like four stars for folks who like these type of blends. Over all, it was good and I enjoyed it in the mornings before work. A very nice rich coffee. Plenty of flavor and very enjoyable to drink. Not a huge fan of this one. Perhaps a bit too medium/mild for me. A good cup of coffee. It has the smoky, nutty flavors, but also has some lighter, almost citrusy flavors sneaking in. I prefer a slightly darker coffee, but I still enjoyed this blend. This was a great cup of coffee, though it's a bit light for my taste. I'm a heavy dark roast drinker and while the flavor profile is great, I'd like something more robust, complex, and rich. This is a French Press coffee. Chemex and drip filters strip the flavors right out of this one. Didn't like it until I tried the press. This has been my favorite so far. It is what can only be described as "the perfect cup of coffee". Great flavor but doesn't overload the senses; very rich yet drinks smoothly. Couldn't ask for more in a great cup of coffee! Bitter and burnt...tasted like it was on the shelf for a month.